The box consists of a beautiful coromandel wood case with polished brass edge and brass stringing with chased brass cartouche. The box opens to reveal wonderful chased brass hinges, fittings and locks, the lid housing a removable mirror having a gold tooled leather back, this and can stand alone or rest on gilded brass fittings within the lid. The interior of the box consists of twelve various glass jars and boxes all having solid silver engraved lids with a blue velvet pin cushion, the silver fittings marked “W.N.” for William Neal of London (1836 to 1879) and assay date letter for 1875 "U” with Queen Victoria and leopard head. 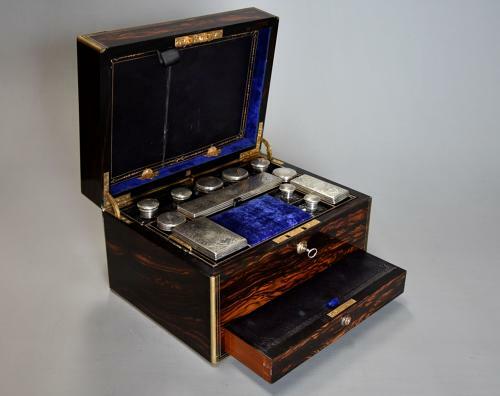 The tray lifts out to reveal a storage area and sprung button at the back of the box releases a hidden drawer which retains the original blue velvet lining ideal for jewellery, pocket watches etc., the box fitted with superb original Bramah locks and key. This vanity box is in excellent original condition, is of stable construction and can go straight into a home or collection.